Two monthly layouts are better than one, so today we're sharing these two very different but equally fun & beautiful December monthly layouts from The Happy Planners™ of seasoned mambi Design Team members Theresa Doan and April Orr. Theresa created a whimsical holiday theme across two pages by using just the 'Jolly Santa' dimensional stickers from one sticker pack, and then coordinating with other function Happy Planner™ stickers. 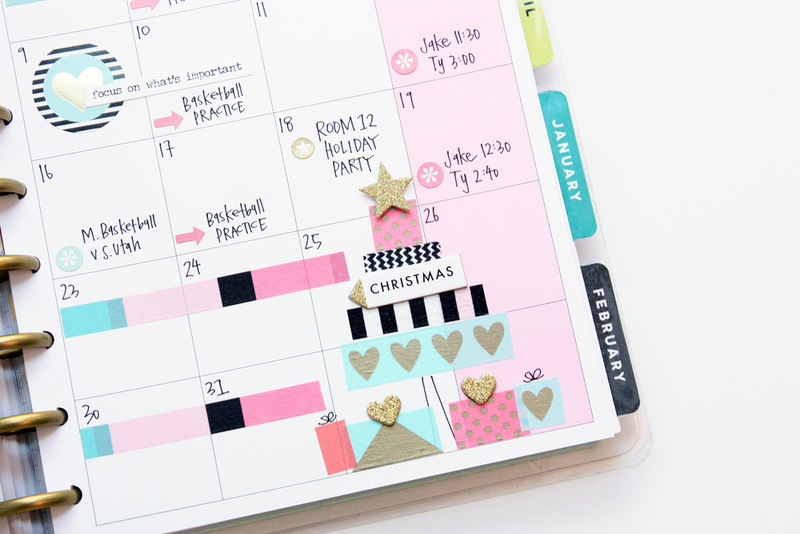 It's a super quick and affordable way to customize your Happy Planner™ pages and get in the Christmas spirit. "Here is the December monthly Happy Planner™ layout I created using the new washi tape and color-coded icon stickers (which I LOOOOOVE). The new stickers make it so easy to color-code activities for my family, especially needed for basketball season where I am trying to keep track of three different basketball schedules!" Shop supplies April used by clicking on the items below. CYBER MONDAY reminder: Our BLACK FRIDAY DEALS (that aren't sold out) are still running through today! Today's your last chance to take advantage of this great opportunity to gather more than enough Happy Planner™ supplies to plan your 2016. Not to mention: the deals make awesome gifts at amazing prices!